Chip Nielsen is the senior political law partner in campaign finance, pay-to-play, initiative, lobbying, conflict of interest and non-profit laws and a member of the firm's Management Committee. He also plays a very important role as one of the firm's top government law strategists. He has been on the Faculty for 38 years and a Co-Chair for 35 years of this PLI seminar. Mr. Nielsen has been actively involved in California state politics and government for over four and one half decades, having been a campaign manager and a political law advisor to numerous politicians and government leaders as well as having served in senior government positions himself, such as Chief Administrative Officer for the California Assembly, Assistant Deputy State Controller and Chief of Staff to the Lieutenant Governor. He is widely published in the area of political law and has been or is a member of the Board of Directors of the California Journal, the Bay Area Council, the North Bay Leadership Council, the American Bar Association Committee on Election Law, the University of California at Berkeley Institute of Governmental Studies National Advisory Board, the American Association of Political Consultants, and the Citizens Research Foundation. He was on the President’s Panel on Federal Judges, Central District of California, in the 2000s. Jan Baran is the founder and co-chair of the Wiley Rein LLP Election Law and Government Ethics Practice Group. 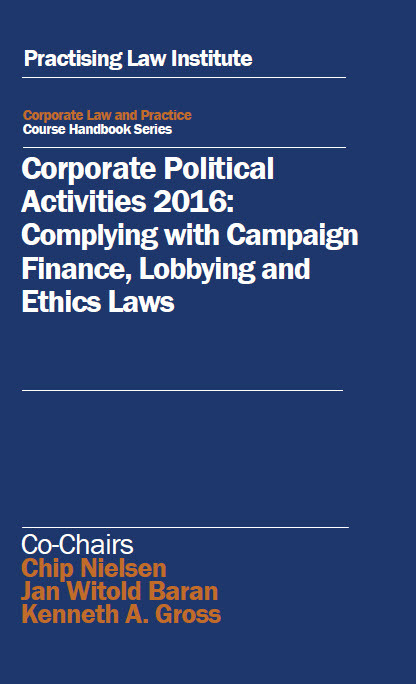 For over forty years, Jan has specialized in the laws that regulate political activity and lobbying including the Federal Election Campaign Act, the Lobbying Disclosure Act, the Ethics in Government Act, as well as related federal, state and local laws. He represents clients before federal and state courts, the Federal Election Commission (FEC), congressional ethics committees and comparable state agencies. He has appeared in numerous First Amendment cases before the Supreme Court of the United States. Jan has been an Executive Assistant to the Chair of the FEC, a member of The President’s Commission on Federal Ethics Law Reform, U.S Ambassador to the World Administrative Radio Conference, General Counsel of the Republican National Committee, Special Recount Counsel to the Virginia Attorney General, and a member of the Virginia Governor’s Commission on Government Finance Reform. He also has been a member of international election observer delegations to foreign countries including The Philippines, Nicaragua, Hungary, and Pakistan. Jan received his Juris Doctor degree from Vanderbilt University Law School, where he was a Patrick Wilson Scholar, and his Bachelor of Arts degree from Ohio Wesleyan University, where he currently serves as a Trustee on the Board of Trustees.